While Officer Jim Wagner was on the Costa Mesa Police Department Police force one of the Reserve police officers, David Schulman, found out that Jim had logged in hours as a student pilot. Officer Schulman encouraged Jim to finish up his flight training and get his Private Pilot’s License and join the United States Air Force Auxiliary Civil Air Patrol for which he was a member. 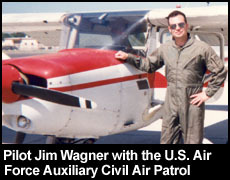 On October 3, 1994 Jim Wagner applied and was accepted into the Falcon Squadron 40 stationed at the United States Marine Corps Air Base El Toro, California. He went back to flight school under Dr. Ernie Maurer at Orange Coast College Technology Division and joined the El Toro Marine Aero Club for flight training. To be a member of the aero club one had to be an active member of the military or reserve. Several months later Jim succeeded in getting his Single Engine Propeller Private Pilot’s License through the Federal Aviation Administration (FAA) and becoming a pilot for the CAP. Senior Member Jim Wagner remained with the El Toro Marine Aero Club until the air base was permanently closed on July 2, 1999. Jim Wagner’s flight training took place in Southern California which contains 60% of the air traffic in the United States within a 60 mile radius of Los Angeles International Airport. When Jim Wagner was 17 years old he did his first solo flight out of John Wayne Airport, the nation’s third busiest airport at the time, and later learned military aviation procedures out of El Toro. Senior Member Jim Wagner operated in the same air space with F-18 and Harrier Jump Jet fighter jets, CH-53 Sea Stallion, and UH-1 Huey helicopters. Jim Wagner flew the Cessna 150 (two seat) and 172 (four seat). In May of 2002 Agent Jim Wagner returned to the Marine Corps Air Base El Toro, which was still owned by the United States Navy, and which served as a temporary headquarters for the United States Air Marshal Service Los Angeles Field Office. The actual office was the building that housed the still standing old control tower.